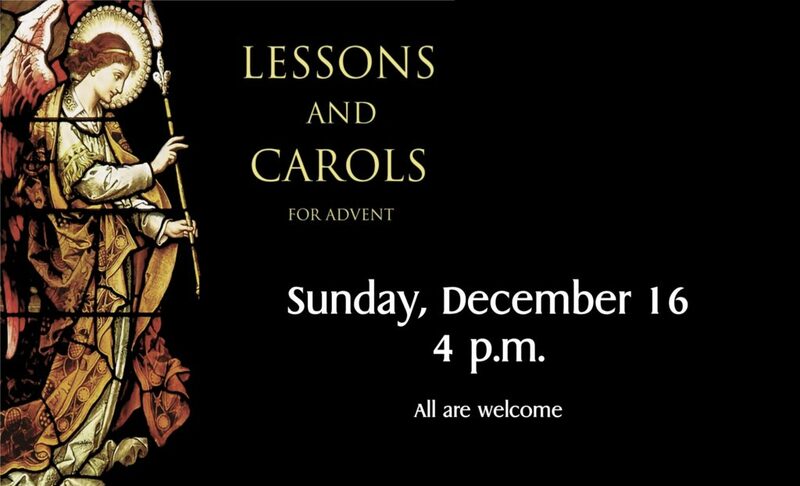 LESSONS AND CAROLS CONCERT AT ST. JOHN’S, SUNDAY, DECEMBER 16, 4 P.M.
A very special concert called “Advent Festival of Lessons and Carols” — that happens just once a year — will be held at St. John’s Sunday, December 16 at 4 p.m. The concert is free and the community is warmly invited to attend. Lessons and Carols concerts are traditionally held during the Church season of Advent. The music of this concert focuses on the impending birth of the Christ Child. In this concert, the magnificent choir of St. John’s Church will sing hymns including “O Come, O Come, Emmanuel”, “Lo, How a Rose E’er Blooming”, “People Look East”, “Of the Father’s Love Begotten”, as well as selections from Handel’s “Messiah”. The music will be interspersed with Bible readings that tell the story of the coming of God’s Son. So that St. John’s may provide appropriate childcare services, concert-goers needing childcare — for infants through 5 years of age — need to pre-register their children for care during the concert. Please contact Roger Bradshaw in the St. John’s Church Office to make childcare arrangements. Prepare for Christmas by attending this beautiful evening service at St. John’s; please invite neighbors, friends, and colleagues. More about St. John’s is available at www.facebook.com/stjohnchrysostom.church. Learn more about the fascinating history of the 138 year-old service of Lessons and Carols!